Perhaps you've lingered at the grocery store wondering which eggs to buy. Are organic eggs better than free-range? Brown eggs healthier than white? This infographic fromt the United States Department of Agriculture aims to answer those pressing questions and more. As you'll see below the only difference between brown and white eggs is the hen who laid them: white-feathered hens lay white eggs, brown -eathered hens lay brown eggs. Are natural eggs better than organic eggs? You'll be surprised to know that eggs labeled ''natural'' eggs have nothing to do with how the hens were raised. 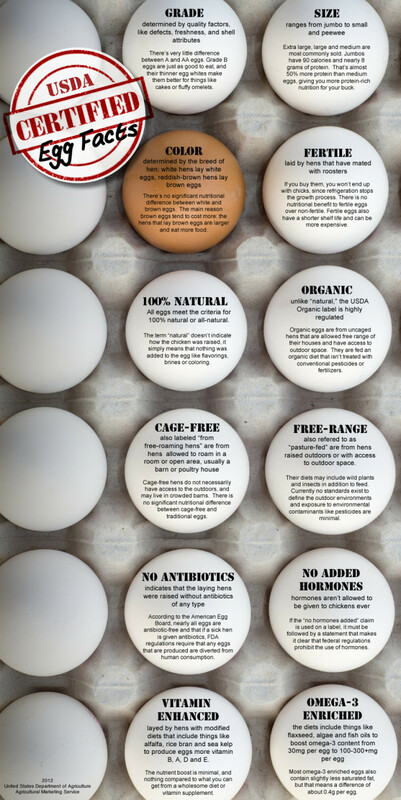 Instead, the label refers to eggs that have no additives like colors or flavorings. Organic eggs, on the other hands, are highly regulated. Eggs labeled ''organic'' are from hens that are allowed free range of their houses and are brought up on an organic diet. It's interesting to note the big difference between cage-free and free-range eggs. The former are from hens who have are allowed to room in a room or have access to an open area. But free-range eggs come from hens who have seen the light of day by roaming the great outdoors. Find out more 'eggstraordinary' facts in the infographic below.